Mother’s Day is on May 11th and looking for that special gift for mom can be over whelming. Father’s Day is not that far behind either! Memorable Gifts wants to make your shopping experience a bit easier. Don’t miss your chance to win a $50 gift certificate to our online store. Memorable Gifts wishes you and your mother a very happy Mother’s Day! 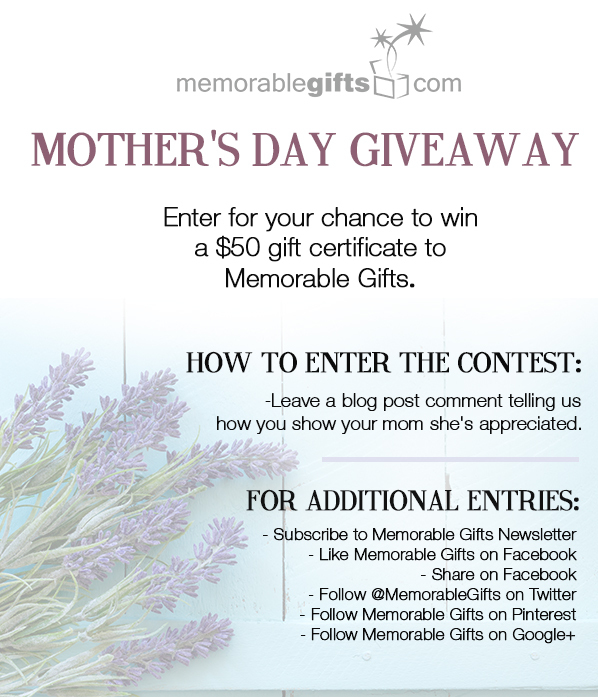 To enter the Mother’s Day giveaway leave a blog post comment telling us how you show your mom she’s appreciated and simply fill out the Rafflecopter form below. Please only one entry per person/email/IP. All entries will be verified and the winner will be selected at random on May 11th. The winner will be contacted on May 12th via email and has 48 hours to respond or another winner will be drawn. Contest ends on May 11, 2014 at 11:59PM. Good luck! I show my mom that she is appreciated not only on Mother’s Day, but as often as I can, I cook for her, watch movies with her and buy her presents throughout the year. I want her to know she is loved every day not only Mother’s day! My Mother is amazing!!! She takes care of my 1 year old twin daughters so my husband and i can work full time. She is absolutely amazing!! I show her she is appreciated as much as I can, by coming home on lunch with her favorite Starbucks drink, I get her flowers, etc. She is my best friend and an amazing Mother and Grandmother. By doing her favorite thing, cooking for her. She loves when her kids cook her meals. Payback for all the times she has done it for us. I make sure that someone visits my mom every day (including me) now at age 82, her health failing and on hospice care, I realize that there is not much time and this makes me sad as I love her so much. I show my mom she’s appreciated by doing nice things for her all year and making sure I listen closely so I know how to help her or what I can do for her. I make sure to call my mom at least 3 times a week, sometimes more. Just checking in with her and catching up on her day is my way of letting her know I’m thinking of her. And I always tell her I love her. My mom is a hardworking mother. She has two jobs and during her free time she takes us to our daily sports activities. she also makes sure to make time for my brothers boy scouts activities. I may show my mother appreciation by buying her the things she loves , for example, Starbucks, Coach bags, shoes, etc but the BIGEST appreciation i show my hard working mother is LOVE. Materialistic items are temporary , Love is FOREVER. I show my mom by giving her a hug, talking to her or just showing her I love her through everyday little things. I have always been the ‘muscle’ behind whatever project my very busy mother undertakes! If she wants to clean out her basement I carry items up and down the stairs for her and in the spring I rototill her garden and reset the rocks around her flower beds! My mother means the world to me. For Morher’s Day we usually make her breakfast and give her flowers, and cards. She is diabetic so candy is out of the question. She has done so much for me and her grandchildren that I would love to give her something more special this year.